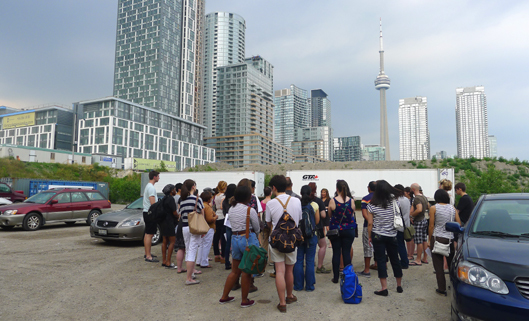 Volunteers gather in the Amsterdam parking lot for a brief training session as the Open Roof Festival prepares to kick-start Summer 2012. Ahhh, summer in Toronto has arrived! And the heatwave of the past few days has finally subsided. Too bad the thunderstorms that brought tonight’s cooler climes (yes, these days 26°C is cool!) also brought the Open Roof Festival indoors – that is, not so open and def not outdoors. And we all know how much I love outdoor cinemas: in green spaces (TIFF in the Park), on water (the way cool Sail-In Cinema)…even in a parking lot (read on)! But thanks to tonight’s looming deluge, Open Roof Festival organizers announced at 6 p.m. this evening that the opening-night outdoor screening ($15 per ticket; see schedule below) would be moved indoors. 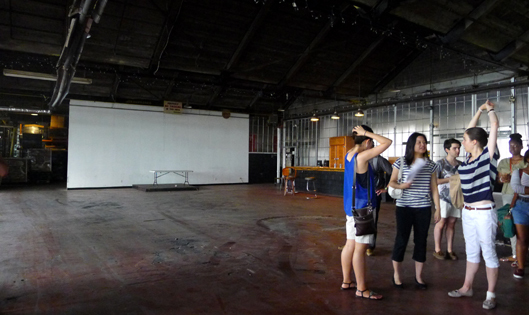 Conveniently, the building beside the lot houses a 250-person industrial event space, complete with a permanent screen, a wee stage and washrooms…. In. A. Brewery. Open Roof screens films rain or shine. If there’s a high chance of showers, the fest moves into the Amsterdam Brewing Company’s event space, which has a permanent screen, washrooms and a 250-person capacity. The Amsterdam Brewing Company, that is. Kicking off its third season tonight, the awesome outdoor summer-long music and film fest that is Open Roof is basically a weekly Thursday night party in the Amsterdam Brewing Company’s parking lot, which can hold more than 600 people (capacity is one of many reasons to wish for good weather). But this empty parking lot, a sunken space ringed with grass and covered with gravel, is transformed as night falls and festival goers pour in, under the stars, with the CN Tower and illuminated downtown skyscrapers creating a beautiful backdrop. Cooler still are the Canadian indie bands opening each of the summer-long festival’s 10 films (check out the list of both below). That’s right! Ticket holders enter at 7:30 p.m., just in time to catch the band at 8 p.m. as they perform on the ground right in front of the screen. How music-fest authentic, with bands within arm’s reach! 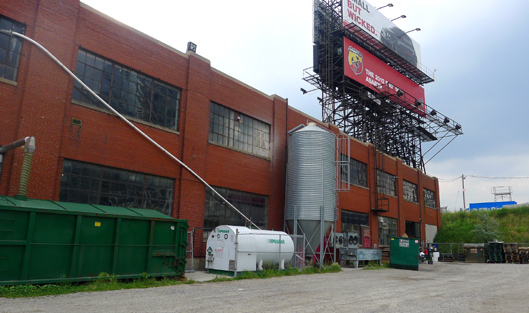 Toronto’s first craft brewery, Amsterdam Brewing Company, is the home of the Open Roof Festival. Given that Open Roof takes place on Amsterdam Brewing Company property, beer from Toronto’s first craft brewery abounds. Be aware that you must purchase drink tickets and can only consume alcohol bought on the microbrewery’s lot. As the brewery store will be open till 11 p.m., beer can be bought at the shop, but it cannot be brought onto the festival grounds, since no outside beverages or food are allowed. Absolutely no glass containers, either. Pair your drinks (nonalcoholic beverages will be available, too) with the featured local food vendor suited to that movie’s theme. Hungry patrons at this week’s film, Marley, about Jamaican musician Bob Marley, were treated to Jamaican food. Yum! And what really gets me excited about the fest is that Cycle Toronto (formerly known as the Toronto Cyclists Union) is offering free bike valet parking on site! Majorly handy, since there’s little bike parking at the brewery. Plus, it encourages cycling to the event. Heart. Now, if you’re spending summer in the city, doesn’t the Open Roof Festival sound like a fun Thursday night out in Toronto? Live music, indie films, beer, food and bikes! I’m so there. Really. I’m a volunteer! 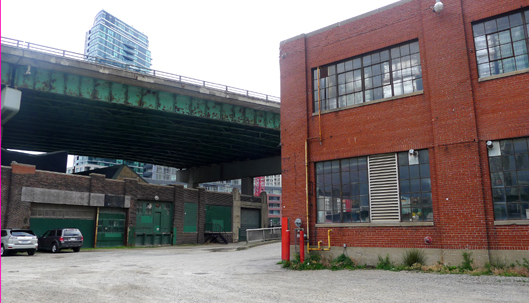 Bad: the Open Roof Festival is beside the Gardiner. Good: the accessible ramp up to the Amsterdam’s washrooms is on the left side of the brewery. What: Open Roof Festival, a music and fest celebrating bands and films. When: Thursdays all summer long (June 21 to Aug. 23, 2012). Doors open at 7:30 p.m.; the band plays at 8 p.m. and the film screens at 9 p.m. Cost: $15 per film. See TIP below about purchasing tickets. Where: The Amsterdam Brewing Company parking lot. It’s a tad out of the way at 21 Bathurst Street, but still accessible by streetcar, bike and foot. The parking lot, BTW, won’t be used as a parking lot, so bike, walk or TTC it. Bonus: There’s a free valet bike parking! Thanks, Cycle Toronto! TIP: Don’t fret if tickets sell out in advance. Organizers limit preshow sales in case the film screens indoors, but they’ll still release tickets the day of. This sounds like a great idea, with a terrific lineup of films, but be forewarned: it’s an event run by amateurs who don’t seem to know much about audio-visual presentation. If you hope to actually see and hear the movie, you might want to go to a real theatre. Very disappointing. Yes, you’re right. It’s true that the screen isn’t supersized and there’s no stadium seating or surround sound, but it’s outdoors! I find Open Roof comparable to other outdoor screenings like those at TIFF in the Park, Harbourfront, Christie Pits (which this year is being co-presented by Open Roof), the Sail-In Cinema, which is back this year! The whole idea of these outdoor screenings, including Open Roof (which throws in Amsterdam beer and a concert), is that you’re not spending your summer inside a theatre — you can enjoy movies every night under the stars, indulging in a picnic while sitting on the grass or drinking a beer while chilling in a chair. Watching films under a blanket of stars… Sigh. What’s disappointing about that?